Ultrasound. Ultrasound imaging, which uses high-frequency sound waves to produce images, is often used for an initial assessment for infants because it's a relatively simple, low-risk procedure. The ultrasound device is placed over the soft spot (fontanel) on the top of a baby's head. Ultrasound may also detect hydrocephalus prior to birth when the procedure is used during routine prenatal examinations. Magnetic resonance imaging (MRI) uses radio waves and a magnetic field to produce detailed 3-D or cross-sectional images of the brain. This test is painless, but it is noisy and requires lying still. Children may need mild sedation for some MRI scans. However, some hospitals use a very fast version of MRI that generally doesn't require sedation. Drawbacks to CT scanning include less detailed images than an MRI, and exposure to a small amount of radiation. CT scans for hydrocephalus are usually used only for emergency exams. A shunt drains excess cerebrospinal fluid from the brain to another part of the body, such as the abdomen, where it can be more easily absorbed. Adults with more-severe complications also may require the services of occupational therapists, social workers, specialists in dementia care or other medical specialists. The timing of diagnosing a child with hydrocephalus may depend on how severe the symptoms are, when problems first appear, and whether there were any significant risk factors during the pregnancy or delivery. 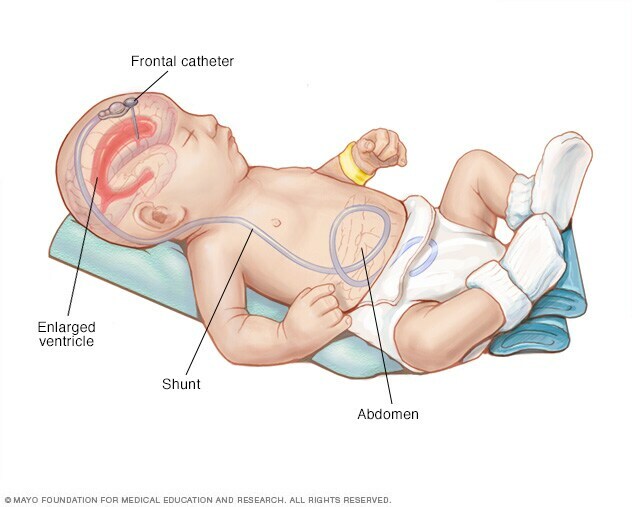 In some cases, hydrocephalus may be diagnosed at birth or prior to birth. If you're seeing a doctor because of the recent onset of symptoms, you'll likely start by seeing your primary care doctor or your child's pediatrician. After an initial evaluation, your doctor may refer you to a doctor who specializes in the diagnosis and treatment of conditions that affect the brain and nervous system (neurologist).